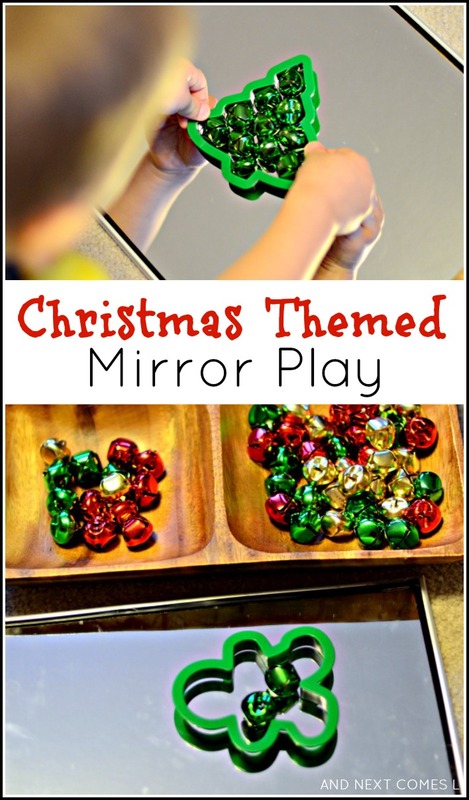 Mirror play has been making a regular appearance at our house lately, usually with some dry erase markers. However, I set up this simple Christmas invitation to play for three year old K and he enjoyed it quite a bit. When I picked J up from school, he was excited to check it out too. He saw it and exclaimed, "Wow! What's this?!" Christmas cookie cutters - Ours are from this 101 Cookie Cutters set. Although this Christmas invitation is so simple, it reinforces math concepts such as volume and estimation. K made a green tree and a gold bell. Then he explored with the "cookie" cookie cutters (aka the gingerbread men cookie cutters) and made them dance around the mirror. It was pretty cute to see his imagination in action! Don't forget that these jingle bells can be used for these other great Christmas activities!